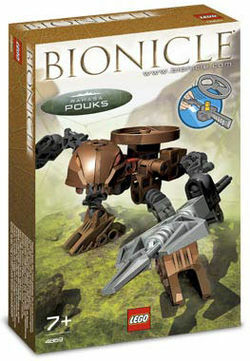 4869 Rahaga Pouks is a BIONICLE set released in 2005. It comes with a brown Rhotuka Spinner, a Rhotuka Launcher, Pouks himself, and his staff. He was one of the six Rahaga released. He was originally a Toa Hagah, but a set was never released of that form. This is a description taken from LEGO.com. Please do not modify it. (see an archive of the product's page) Tamer of mighty creatures! Pouks hunts only the largest and most dangerous Rahi! Using his Rhotuka bolo spinner, he entangles them in bonds of energy to bring them down. Fearless, there is no beast Pouks will not pursue and tame. Add #4869 & #4870 to this set to build a Rahi Ice Vemrin! His head and weapon are the same as those of the Rahkshi Panrahk. He appears briefly in BIONICLE 3: Web of Shadows but does not talk. Facts about "4869 Rahaga Pouks"
This page was last edited on 1 May 2016, at 16:04.